"This is the best, friendliest, most enjoyable, and MOST VALUABLE hypnosis conference anywhere." "I am thoroughly enjoying (and learning) from the various presentations! Thank you for arranging this each year." "I don't normally like web classes, but did watch several of the live streaming and must admit the quality and ease of use was surprising. Good job!" "Every year you are doing better and better in every way possible." "Your presentation at the IMDHA Conference, was captivating. I attended via the virtual conference and it would have been wonderful to be able to experience you in person. I am very humbled." "Thanks so much for all of the hard work that went into the conference! You provided a very positive environment for all of us to come, make friends and learn." "I've been to instructor meetings of many organizations – this was the first PRODUCTIVE one I’ve been to." "Thank you for making it possible to have the best conference experience ever! I am especially grateful to both learn from and present alongside some of the ‘rock stars’ in our field. The quality of your support is without parallel. All in all the IMDHA conference was a singularly positive experience." "Good for you - I knew our rapidly changing electronics would take IMDHA places I only hoped for!" "Thank you for inviting me to be a part of this terrific conference. As always it’s so wonderful to be surrounded by so many like-minded people." "You organized a GREAT event! I plan to bring my wife and boys in 2016"
"I’ve been to many conferences around the world and deem the IMDHA/IACT one of the best." "I loved the conference this year and already turned in my reservation for an ocean front room next year. So excited!" "I am impressed with the professional and scientific quality of the presentations / trainings and warm collegial atmosphere in the IMDHA." "I really enjoyed the convention. It was my first one and certainly won't be my last!" "What a great Conference! - I had a wonderful time, both teaching and learning." "Thank you for a truly stellar weekend. It couldn't have been better! Every detail from the warm greetings to the gift bags to the artist and popcorn added to the upliftment. AND of course your family; beautiful each…"
"It was a great conference! I always feel like I am going to a family reunion. Thank you for your generosity and support over the years." "Hey! This app is sensational … thanks." "What a fabulous time in Daytona! On the first day, I opened up my balcony curtains to see the most beautiful rainbow over the ocean! It was a perfect way to start the weekend. 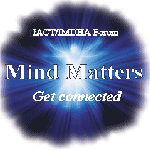 The booths in the hall outside the classes were filled with knowledgeable practitioners and products helpful to professional hypnotists, the product prices were good, and a discount was given for purchase of the mp3 recordings of the 2014 presentations during the time of the conference. Great resources!!! This conference is a highlight of my year. Next year, I may stay an additional day to unwind and walk on the beach, swim in the heated pool for a day of rest before or after the conference. The hotel was friendly, comfortable, and the access to food was good. The in-room kitchen made it easy to relax and be nourished in the way I prefer. When I'm not eating out with other great hypnotists, the in-room kitchens make it easy to have a private dinner." "Wow! I can’t thank you enough for this great gathering of professional friends. There’s so much to learn and share and this warm, inviting community has given me so much through the years. And it keeps getting better and better. I've got my reservations for next year and I’m looking forward to seeing you all again." "You Rock! I always have such an amazing time at this conference. The caliber of trainers and participants can't be beat. And the view!!!! Thank you Linda and Robert for taking such good care of us." 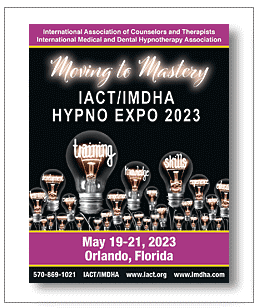 "This year's IACT/IMDHA EXPO was a joy from start to finish! I have already reserved my room for next year and I highly recommend that every one plan on being there next year! The seminars and workshops are 1st rate and the opportunity to enjoy spending time with old and new friends is always a highlight." "I loved the conference this year. The speakers and teachers were wonderful with such a wide range of topics to choose from. I've been to many hypnosis conferences and the awards this year went to the very people who best deserved them in every category! Kudos!" "It was a wonderful weekend and it's obvious why this is such a great Association to be a part of. Robert and Linda you are amazing and your leadership is top notch!" "Thank you and your staff for another amazing experience at Hypno-Expo." "Wow, the app is great!!!! Downloading now!!!" "I couldn't make the conference so religiously sat at my PC streaming the talks. I hadn't expected they would stream Cheryl Elman's workshop so was thrilled to find that they did. Great stuff, indeed!" "First and foremost, the conference was wonderful. You brought a cohesiveness of professionalism among hypnotherapists all of whom are working toward the advancement in our field. Thank you." "I'm impressed. I have no idea how to use all this app stuff, but I know it is what is needed to keep younger folks and pull in new ones. Way to go IMDHA/IACT. Thanks for keeping us relevant." "You had an excellent conference. Fun, informative, friendly and well run!!! Congratulations to you and your wonderful staff. And what a great location! Thanks again for all you do for our profession." "What a great idea! I just downloaded the app and checked it out." "Thanks for a great conference. I’m not sure what I liked the best. The chance to see old friends and meet new ones is always a highlight. The value of the courses I selected is represented to the numerous pages of notes. The administration of the conference was seamless and efficient. I belong to several hypnosis and non-hypnosis organizations. However in my heart I feel that IMDHA is my home." "My experience in Daytona FL could not have been any richer. Thank you for such a wonderful and versatile menu of speakers and topics. This is one Conference that I will never forget. What a pleasure to have the halls and classrooms full of chatter and excitement. The staff was most gracious and helpful, and the host and hostess quite pronominal! Let me mention also that the facility was superb in all aspects. It is my honor to be involved with such a professional organization." "I want to thank you for your warmth and generosity in Daytona. You made me feel so welcome and proud to be part of the Conference. I had a wonderful time, and was so happy to have the opportunity to contribute formally. I'm already a hypnosis junkie, now I'm getting hooked on IACT. So I want to contribute more in whatever way I can. Again, thanks so much for the little touches and care behind everything. The whole attitude and setup meant a lot, and definitely moved me to step up my game and be involved." "Thank you all! Robert and Linda, the fantastic staff who make the conference hum, all the presenters and attendees and each of you who participate and support this delightful craft we call hypnosis." "The conference was incredible. I have been to many conferences with a multitude of specialties and have never been to a conference filled with so much love and respect for each and every participant. It is clear that Linda, Robert and their fabulous staff are focused on the membership and their needs. The words I would use to describe the conference would be RESPECTFUL - CARING - INNOVATIVE - EDUCATIONAL - SUPPORTING - FUN !!!!! I enjoyed the range of expertise that were present... from the Masters in our field to the new generation... we had the opportunity to learn from them all in an environment of respect that Robert and Linda provide for us all to gather together to learn, share and rejoice. Thank You, Linda, Robert and the PREMO crew." "It was a great conference and I learned a lot from all the great presenters. I will definitely go to the next Conference in Daytona Beach again next year. Thanks for those unsung heroes who put in a lot of effort into the Conference. My hats is up for all of you." "What a fabulous conference in Daytona! Such lovely people, good presenters, excellent setting, and fine food. I'll be back next year." "What a fabulous conference! Many thanks for this entire process. You outdid yourselves (as if that’s possible). The presenters were outstanding, the process was smooth and the whole experience was wonderful. Ease in access to the conference was phenomenal. I have many new tools to use, sources to access and concepts to implement… thanks to you. Thank you again for the time, effort and energy put into this event. I was able to see and experience presenters that I had wanted to see for years. I’m still on a high!" "I just finished the Virtual Conference. Thank you so much for offering this option! I still got really great training and I could keep all the other balls that I juggle still in the air! AWESOME!!!" "Thank you again for a GREAT conference experience this year." "I have attended other conferences and this by far was the best. As a newbie, I really felt welcome and a part of a family who truly looks out for each other. I am definitely coming back." "Excellent speakers. Excellent attendees. And we were next to the beach! Perfect weekend!" "Thanks to you both and your awesome staff, I had a simply delightful conference. You and your staff are ever present and anticipated the participant’s every need. It never ceases to amaze me how phenomenal the quality and diversity of the presenters are. Each year I anticipate meeting new stimulating attendees from around the globe and I am never disappointed. In fact, I have already begun incorporating several of the exceptional strategies I learned there. Thanks again, for recharging my batteries. See ya’ll next year!" "It was one of the best conferences I have ever attended!" "This was my first conference and it was amazing! The speakers were terrific and the members were so friendly and helpful with ideas for starting my practice full time. I’ve already leased an office and can’t wait to get started. Looking forward to next year." "What a marvelous convention this year – great fun, tremendous workshops, and convivial atmosphere. Looking forward to next year." "Because of my teaching schedule I was unable to attend in person for the past 2 or 3 years. The virtual stream allowed me to continue to be a part of everything and that made a big difference." "The presenters were amazing and it was a wonderful opportunity to learn and listen. I look forward to the next conference in Daytona." "You put together a great conference. You handled all of the limitations of the hotel with grace and graciousness." "The classes were extremely educational for me and life changing. I am forever grateful for this opportunity, and so excited to be part of it all. I'm looking forward to next year. CAN'T WAIT!! Daytona here we come!" "I cannot begin to tell you how much my life has been affected by the opportunity made possible last weekend. Since then, I have often referred to it as one of the best weekends of my entire life. Further, I had made some very dear friends and continue to correspond with them. Thanks again for making it all possible. It was fantastic!!!"